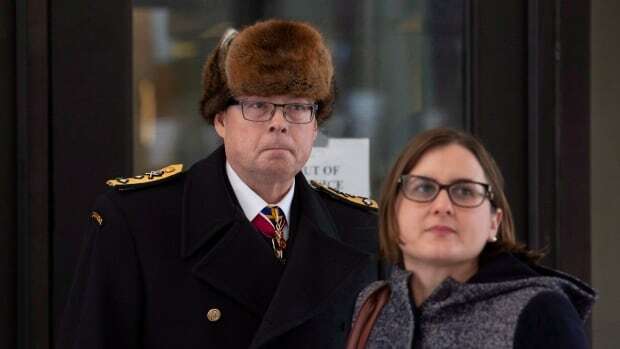 A federal procurement official charged with breach of trust was told by the RCMP roughly two years ago that he also was in a suspect in the same investigation into the alleged leaking of cabinet secrets which had ensnared Vice-Admiral Mark Norman. Matthew Matchett’s lawyer, Matthew Day, revealed that fact in court Tuesday as a date for a preliminary hearing was set in Ontario Superior Court. Marchett was charged with one count of breach of trust on Feb. 13, while Norman, the former commander of the navy, also faces one count of breach of trust and was charged in April 2018. Day tore a strip off the Crown saying his client has yet to see all of the evidence gathered against him despite the time it has taken to investigate. “We’ve been waiting for two years for the other shoe to drop,” Day told the court. The detail is significant because lawyers for Norman, the former vice-chief of the defence staff, and the Conservative opposition have publicly questioned why it took so long to charge Matchett and have sought records related to the handling his case. The preliminary inquiry will run over three days, starting Oct. 23. Crown attorney Jeannine Plamondon told the court prosecutors believed the hearing, which is meant to convince a judge there is enough of a case to warrant a trial, could have been handled in half a day. She also said, in a closed-door pretrial conference earlier this month, the Crown offered earlier dates and to break up the hearing into different appearances, but they were rejected. Plamondon said she wanted it on the record because of the Supreme Court of Canada’s requirement for a speedy trial. The contents of the pretrial conference were supposed to be kept secret, Day noted. “There’s something ironic, I suppose, about the discussions being made at a confidential pre-trial conference being put on the record … considering the nature of these charges,” he said. Both Matchett and Norman are accused of leaking cabinet secrets related to the Liberal government’s discussions surrounding a $668-million project to lease a supply ship to the navy 3½ years ago. Matchett is accused of passing cabinet documents — a memo and a slide deck presentation — to an Ottawa lobbyist working for the shipyard ahead of a critical, closed-door meeting in November 2015. During that meeting, the newly elected Liberal government decided to put the program on hold. Norman is accused of leaking the news of that decision to a CBC reporter. The Crown also alleges the former commander of the navy was slipping cabinet secrets to Davie in the run-up to the contract signing under the former Conservative government. Norman’s case is expected to go to trial this summer. His lawyers have alleged political interference, alleging that the Privy Council Office was directing the prosecution — likely at the behest of the Prime Minister’s Office. The issue of access to federal government documents has dominated pretrial hearings in the Norman case where his lawyers have been fighting since October for internal emails, texts and other messages between the Prime Minister’s Office and the Privy Council Office. The search included issuing subpoenas earlier this winter for documents belonging to Prime Minister Justin Trudeau, his former principal secretary Gerald Butts, Katie Telford, the prime minister’s chief of staff and Privy Council clerk Michael Wernick, among others. Justice Canada lawyer Robert McKinnon told the court on Monday most of the records in the Norman case have been delivered to the trial judge, Heather Perkins-McVey, who will decide what material is relevant.